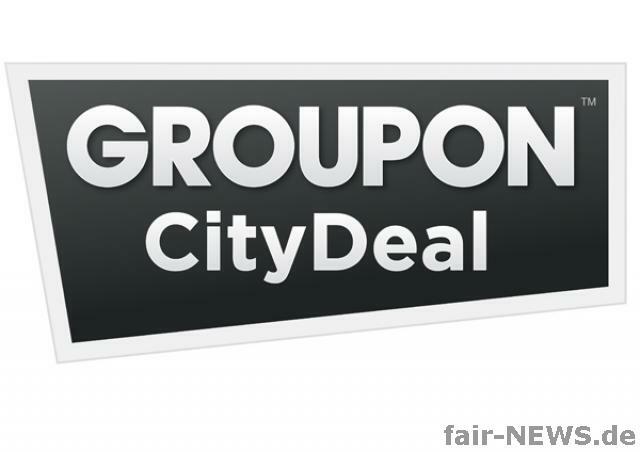 Some weeks ago we were contacted by Groupon CityDeal, who were interested in working with us towards offering interesting activities for their Group Deals, and we found this was an interesting opportunity to get to know this system from the inside and accepted the proposal as a learning experience. Groupon is a Northamerican company created in 2008 by Andrew Mason based in Chicago USA and currently classified as the fasted growing company in history, due to its business model. It promotes discount vouchers to very large databases of users in more than 250 countries across the planet. People acquire discounts that are available for 24 or 48 hours only as a special collective deal. The first idea that came up at Algo Bueno was to create a PhotoCircuits promotion specially designed to fit a Christmas Gift and it had to be affordable, attractive and desirable for a wide range of customers, and that is exactly what we did. The way it works is very interesting and of course profitable. Groupon hunts for interesting products or activities that can attract people massively in short time and partners with local products / services to promote for 24 or 48 hours with an attractive discount (40-80%). The Service/Product provider finds out the biggest discount they can offer, looking for massive sales and promotion in a short time. Groupon opens a promotion for 24 hours offering your commodity directly to customers, who buy from Groupon’s website. Some promotions remains for an additional 24 more hours as a side promotion not in front page, offering customers the opportunity to still buy the promo. The promotion closes and they might have sold a big amount of commodities, but the sales results haven’t reached your business yet. 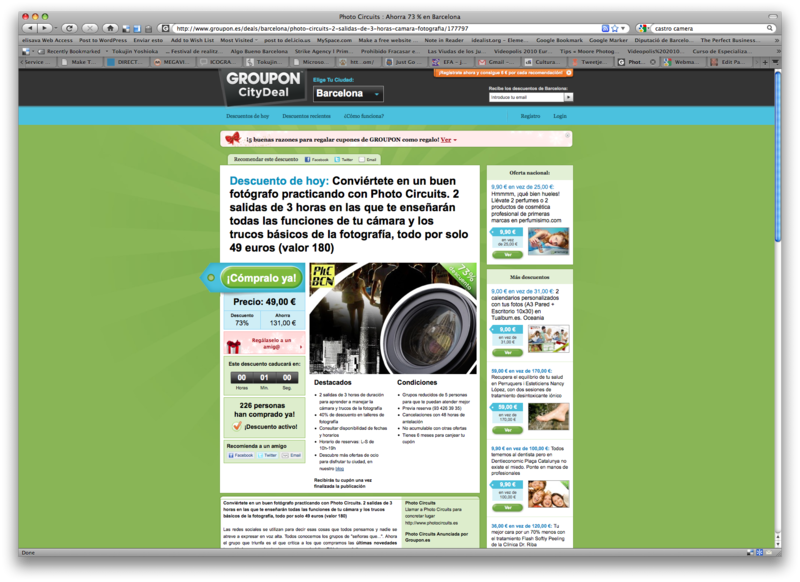 A big amount of discount coupons have been sold by Groupon. Groupon provides you with a list of codes corresponding to the Vouchers that have been sold in the last 48 hours. You provide the service or sell the discounted product and then charge group in a period of 6 months. This represents a great opportunity to promote new services and products, to introduce new ideas to the public and to test future products and service at a great scale with a very low investment. Groupon reaches a very big number of potential clients interested in getting involved and wanting to try out new activities, products and services. Most of those potential clients are young middle class women with a good level of education and an open mind, looking for new opportunities and experiences. This promotional space is fully pre-designed and impact is guaranteed, so the marketing research, clusters and database work is done, and no investment is required. Just a couple of good attractive ideas to bring more people’s attention to your business. The territory for the promotion has also been set by Groupon and there is the possibility of running multiple cities, sequences of cities or regions depending on the capacity of the company offering the commodity. You can choose one city or several depending on how your business runs. Crowdshopping is a very good tool for entrepreneurs who wish to give impulse to their small businesses but do not have the resources to do it themselves. Designing these type of promotion is not an easy task but we can always give your company a hand with it you find it useful. Apparently a lot of people buy the promotion, but they did not really buy the commodity, they just a bought the intention to buy it. A lot of people buy the Vouchers during the 24 to 48 hour promo, then those coupons have a validity of 6 to 24 months. In that period of time the service should be provided to the client. This gap in time, means that not every coupon becomes an effective sale. Since people buy and give these coupons as gifts to other people, that remain unused or forgotten during the period of validity. A lot people even forget they have bought the voucher, postpone making their purchase or reservation and finally loose it. Considering that not everyone uses the Vouchers, this system can be a great promotion tool for start up companies who wish to boost their communications, but not as a way to boost sales or increase revenue on new commodities. And in general, all pre paid services that are available but consumers eventually never use. In this case sold by a third party that invest large amounts of money in self promotion to attract a massive number of coupon buyers. Crowdshopping is a brilliant method that benefits all parts, consumers, companies and Groupon itself. We are currently observing all copycats and versions of this systems that may lead to new creative ways for consumer to act as prosumers with companies offering more accurate and desirable products and service at prices regulated by demand and not by speculation. Probably in the future, as Doc Searls from project VRM at Harvard University proposes, customers will manage service providers with Vendor Relationship management Systems instead of Companies managing them with the now almost obsolete CRM Systems. Consumption is changing all markets and a revolution is going on.